"Atomic power" and "Atomic Power" redirect here. For the film, see Atomic Power (film). This article is about nuclear fission and fusion power sources primarily. For commercial quantities of nuclear energy attained from nuclear decay, see Geothermal energy. For the political term, see List of states with nuclear weapons. The 1200 MWe, Leibstadt fission-electric power station in Switzerland. The boiling water reactor (BWR), located inside the dome capped cylindrical structure, is dwarfed in size by its cooling tower. The station produces a yearly average of 25 million kilowatt-hours per day, sufficient to power a city the size of Boston. 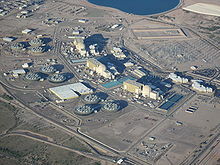 The Palo Verde Nuclear Generating Station, the largest in the US with 3 pressurized water reactors(PWRs), is situated in the Arizona desert. It uses sewage from cities as its cooling water in 9 squat mechanical draft cooling towers. Its total spent fuel/"waste" inventory produced since 1986, is contained in dry cask storage cylinders located between the artificial body of water and the electrical switchyard. U.S. nuclear powered ships,(top to bottom) cruisers USS Bainbridge, the USS Long Beach and the USS Enterprise, the longest ever naval vessel, and the first nuclear-powered aircraft carrier. Picture taken in 1964 during a record setting voyage of 26,540 nmi (49,190 km) around the world in 65 days without refueling. Crew members are spelling out Einstein's mass-energy equivalence formula E = mc2 on the flight deck. The Russian nuclear-powered icebreaker NS Yamal on a joint scientific expedition with the NSF in 1994. In 2011 nuclear power provided 10% of the world's electricity In 2007, the IAEA reported there were 439 nuclear power reactors in operation in the world, operating in 31 countries. In Japan, all nuclear reactors were gradually shut down in the wake of the 2011 destruction of the Fukushima Dai-ichi plant to be assessed for safety. 25 reactors have applied for restart, and on August 11, 2015 Kyushu Electric Power restarted the number one reactor at its Sendai plant. In 2011 worldwide nuclear output fell by 4.3%, the largest decline on record, on the back of sharp declines in Japan (-44.3%) and Germany (-23.2%). Nuclear fission power is a low carbon power generation method of producing electricity, and gives similar greenhouse gas emissions per unit of energy generated to renewable energy. As all electricity supplying technologies use cement etc., during construction, emissions are yet to be brought to zero. A 2014 analysis of the carbon footprint literature by the Intergovernmental Panel on Climate Change (IPCC) reported that fission electricities embodied total life-cycle emission intensity value of 12 g CO2 eq/kWh is the lowest out of all commercial baseload energy sources, and second lowest out of all commercial electricity technologies known, after wind power which is an Intermittent energy source with embodied greenhouse gas emissions, per unit of energy generated of 11 g CO2eq/kWh. Each result is contrasted with coal & fossil gas at 820 and 490 g CO2 eq/kWh. With this translating into, from the beginning of Fission-electric power station commercialization in the 1970s, having prevented the emission of about 64 billion tonnes of carbon dioxide equivalent, greenhouse gases that would have otherwise resulted from the burning of fossil fuels in thermal power stations. Far-reaching fission power reactor accidents, or accidents that resulted in medium to long-lived fission product contamination of inhabited areas, have occurred in Generation I & II reactor designs, blueprinted between 1950 and 1980. These include the Chernobyl disaster which occurred in 1986, the Fukushima Daiichi nuclear disaster (2011), and the more contained Three Mile Island accident (1979). There have also been some nuclear submarine accidents. In terms of lives lost per unit of energy generated, analysis has determined that fission-electric reactors have caused fewer fatalities per unit of energy generated than the other major sources of energy generation. Energy production from coal, petroleum, natural gas and hydroelectricity has caused a greater number of fatalities per unit of energy generated due to air pollution and energy accident effects. Four years after the Fukushima-Daiichi accident, there have been no fatalities due to exposure to radiation, and no discernible increased incidence of radiation-related health effects are expected among exposed members of the public and their descendants. The Japan Times estimated 1,600 deaths were the result of evacuation, due to physical and mental stress stemming from long stays at shelters, a lack of initial care as a result of hospitals being disabled by the disaster, and suicides. December 2, 1942. A depiction of the scene when scientists observed the world's first man made nuclear reactor, the Chicago Pile-1, as it became self-sustaining/critical at the University of Chicago. But in 1938, German chemists Otto Hahn and Fritz Strassmann, along with Austrian physicist Lise Meitner and Meitner's nephew, Otto Robert Frisch, conducted experiments with the products of neutron-bombarded uranium, as a means of further investigating Fermi's claims. They determined that the relatively tiny neutron split the nucleus of the massive uranium atoms into two roughly equal pieces, contradicting Fermi. This was an extremely surprising result: all other forms of nuclear decay involved only small changes to the mass of the nucleus, whereas this process—dubbed "fission" as a reference to biology—involved a complete rupture of the nucleus. Numerous scientists, including Leó Szilárd, who was one of the first, recognized that if fission reactions released additional neutrons, a self-sustaining nuclear chain reaction could result. Once this was experimentally confirmed and announced by Frédéric Joliot-Curie in 1939, scientists in many countries (including the United States, the United Kingdom, France, Germany, and the Soviet Union) petitioned their governments for support of nuclear fission research, just on the cusp of World War II, for the development of a nuclear weapon. In 1945, the pocketbook The Atomic Age heralded the untapped atomic power in everyday objects and depicted a future where fossil fuels would go unused. One science writer, David Dietz, wrote that instead of filling the gas tank of your car two or three times a week, you will travel for a year on a pellet of atomic energy the size of a vitamin pill. Glenn Seaborg, who chaired the Atomic Energy Commission, wrote "there will be nuclear powered earth-to-moon shuttles, nuclear powered artificial hearts, plutonium heated swimming pools for SCUBA divers, and much more". These overly optimistic predications remain unfulfilled. United Kingdom, Canada, and USSR proceeded over the course of the late 1940s and early 1950s. 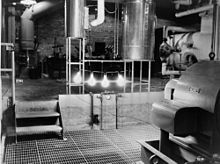 Electricity was generated for the first time by a nuclear reactor on December 20, 1951, at the EBR-I experimental station near Arco, Idaho, which initially produced about 100 kW. Work was also strongly researched in the US on nuclear marine propulsion, with a test reactor being developed by 1953 (eventually, the USS Nautilus, the first nuclear-powered submarine, would launch in 1955). In 1953, US President Dwight Eisenhower gave his "Atoms for Peace" speech at the United Nations, emphasizing the need to develop "peaceful" uses of nuclear power quickly. This was followed by the 1954 Amendments to the Atomic Energy Act which allowed rapid declassification of U.S. reactor technology and encouraged development by the private sector. One of the first organizations to develop nuclear power was the U.S. Navy, for the purpose of propelling submarines and aircraft carriers. The first nuclear-powered submarine, USS Nautilus (SSN-571), was put to sea in December 1954. As of 2016, the U.S. Navy submarine fleet is made up entirely of nuclear-powered vessels, with 75 submarines in service. Two U.S. nuclear submarines, USS Scorpion and USS Thresher, have been lost at sea. The Russian Navy is currently (2016) estimated to have 61 nuclear submarines in service; eight Soviet and Russian nuclear submarines have been lost at sea. This includes the Soviet submarine K-19 reactor accident in 1961 which resulted in 8 deaths and more than 30 other people were over-exposed to radiation. The Soviet submarine K-27 reactor accident in 1968 resulted in 9 fatalities and 83 other injuries. Moreover, Soviet submarine K-429 sank twice, but was raised after each incident. Several serious nuclear and radiation accidents have involved nuclear submarine mishaps. The U.S. Army also had a nuclear power program, beginning in 1954. 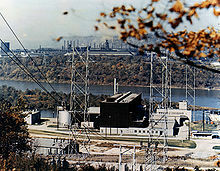 The SM-1 Nuclear Power Plant, at Fort Belvoir, Virginia, was the first power reactor in the U.S. to supply electrical energy to a commercial grid (VEPCO), in April 1957, before Shippingport. The SL-1 was a U.S. Army experimental nuclear power reactor at the National Reactor Testing Station in eastern Idaho. It underwent a steam explosion and meltdown in January 1961, which killed its three operators. In Soviet Union in The Mayak Production Association there were a number of accidents including an explosion that released 50-100 tonnes of high-level radioactive waste, contaminating a huge territory in the eastern Urals and causing numerous deaths and injuries. The Soviet regime kept this accident secret for about 30 years. The event was eventually rated at 6 on the seven-level INES scale (third in severity only to the disasters at Chernobyl and Fukushima). 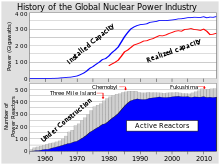 Installed nuclear capacity initially rose relatively quickly, rising from less than 1 gigawatt (GW) in 1960 to 100 GW in the late 1970s, and 300 GW in the late 1980s. Since the late 1980s worldwide capacity has risen much more slowly, reaching 366 GW in 2005. Between around 1970 and 1990, more than 50 GW of capacity was under construction (peaking at over 150 GW in the late 1970s and early 1980s) — in 2005, around 25 GW of new capacity was planned. More than two-thirds of all nuclear plants ordered after January 1970 were eventually cancelled. A total of 63 nuclear units were canceled in the USA between 1975 and 1980. Health and safety concerns, the 1979 accident at Three Mile Island, and the 1986 Chernobyl disaster played a part in stopping new plant construction in many countries, although the public policy organization, the Brookings Institution states that new nuclear units, at the time of publishing in 2006, had not been built in the U.S. because of soft demand for electricity, and cost overruns on nuclear plants due to regulatory issues and construction delays. By the end of the 1970s it became clear that nuclear power would not grow nearly as dramatically as once believed. Eventually, more than 120 reactor orders in the U.S. were ultimately cancelled and the construction of new reactors ground to a halt. A cover story in the February 11, 1985, issue of Forbes magazine commented on the overall failure of the U.S. nuclear power program, saying it "ranks as the largest managerial disaster in business history". Since about 2001 the term nuclear renaissance has been used to refer to a possible nuclear power industry revival, driven by rising fossil fuel prices and new concerns about meeting greenhouse gas emission limits. In 2012, the World Nuclear Association reported that nuclear electricity generation was at its lowest level since 1999. As of January 2016, however, 65 new nuclear power reactors were under construction. Over 150 were planned, equivalent to nearly half of capacity at that time. Japan's 2011 Fukushima Daiichi nuclear accident, which occurred in a reactor design from the 1960s, prompted a re-examination of nuclear safety and nuclear energy policy in many countries. Germany plans to close all its reactors by 2022, and Italy has re-affirmed its ban on electric utilities generating, but not importing, fission derived electricity. In 2011 the International Energy Agency halved its prior estimate of new generating capacity to be built by 2035. In 2013 Japan signed a deal worth $22 billion, in which Mitsubishi Heavy Industries would build four modern Atmea reactors for Turkey. In August 2015, following 4 years of near zero fission-electricity generation, Japan began restarting its fission fleet, after safety upgrades were completed, beginning with Sendai fission-electric station. In March 2011 the nuclear emergencies at Japan's Fukushima Daiichi Nuclear Power Plant and shutdowns at other nuclear facilities raised questions among some commentators over the future of the renaissance. China, Germany, Switzerland, Israel, Malaysia, Thailand, United Kingdom, Italy and the Philippines have reviewed their nuclear power programs. Indonesia and Vietnam still plan to build nuclear power plants. The World Nuclear Association has said that "nuclear power generation suffered its biggest ever one-year fall through 2012 as the bulk of the Japanese fleet remained offline for a full calendar year". Data from the International Atomic Energy Agency showed that nuclear power plants globally produced 2346 TWh of electricity in 2012 – seven per cent less than in 2011. The figures illustrate the effects of a full year of 48 Japanese power reactors producing no power during the year. 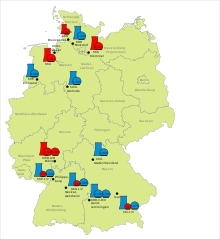 The permanent closure of eight reactor units in Germany was also a factor. Problems at Crystal River, Fort Calhoun and the two San Onofre units in the USA meant they produced no power for the full year, while in Belgium Doel 3 and Tihange 2 were out of action for six months. Compared to 2010, the nuclear industry produced 11% less electricity in 2012. Eight of the seventeen operating reactors in Germany were permanently shut down following the March 2011 Fukushima nuclear disaster. The Fukushima Daiichi nuclear accident sparked controversy about the import of the accident and its effect on nuclear's future. IAEA Director General Yukiya Amano said the Japanese nuclear accident "caused deep public anxiety throughout the world and damaged confidence in nuclear power", and the International Energy Agency halved its estimate of additional nuclear generating capacity to be built by 2035. But by 2015, the Agency's outlook had become more promising. "Nuclear power is a critical element in limiting greenhouse gas emissions," the agency noted, and "the prospects for nuclear energy remain positive in the medium to long term despite a negative impact in some countries in the aftermath of the [Fukushima-Daiichi] accident...it is still the second-largest source worldwide of low-carbon electricity. And the 72 reactors under construction at the start of last year were the most in 25 years." Though Platts reported in 2011 that "the crisis at Japan's Fukushima nuclear plants has prompted leading energy-consuming countries to review the safety of their existing reactors and cast doubt on the speed and scale of planned expansions around the world", Progress Energy Chairman/CEO Bill Johnson made the observation that "Today there’s an even more compelling case that greater use of nuclear power is a vital part of a balanced energy strategy". In 2011, The Economist opined that nuclear power "looks dangerous, unpopular, expensive and risky", and that "it is replaceable with relative ease and could be forgone with no huge structural shifts in the way the world works". Earth Institute Director Jeffrey Sachs disagreed, claiming combating climate change would require an expansion of nuclear power. "We won't meet the carbon targets if nuclear is taken off the table," he said. "We need to understand the scale of the challenge." Investment banks were critical of nuclear soon after the accident. Many disputed their impartiality, however, due to significant investments in renewable energy, perceived by some as a valid alternative to nuclear. In early April 2011, analysts at Swiss-based investment bank UBS said: "At Fukushima, four reactors have been out of control for weeks, casting doubt on whether even an advanced economy can master nuclear safety...we believe the Fukushima accident was the most serious ever for the credibility of nuclear power". UBS has helped to raise more than $20 billion since 2006 and advised on more than a dozen deals for renewable energy and cleantech companies. Deutsche Bank advised that "the global impact of the Fukushima accident is a fundamental shift in public perception with regard to how a nation prioritizes and values its populations health, safety, security, and natural environment when determining its current and future energy pathways...renewable energy will be a clear long-term winner in most energy systems, a conclusion supported by many voter surveys conducted over the past few weeks. Deutsche Bank has over €1 billion in capital invested in renewables projects in Europe, North & South America, and Asia. Manufacturers also recognized a profit opportunity in negative public perceptions about nuclear. In September 2011, German engineering giant Siemens announced it will withdraw entirely from the nuclear industry, as a response to the Fukushima nuclear accident in Japan, and said that it would no longer build nuclear power plants anywhere in the world. The company’s chairman, Peter Löscher, said that "Siemens was ending plans to cooperate with Rosatom, the Russian state-controlled nuclear power company, in the construction of dozens of nuclear plants throughout Russia over the coming two decades". Renewable energy is a core component of Siemens's profit base. In February, 2016 the firm proposed a €10 billion renewable energy investment in Egypt. In February 2012, the United States Nuclear Regulatory Commission approved the construction of two additional reactors at the Vogtle Electric Generating Plant, the first reactors to be approved in over 30 years since the Three Mile Island accident, but NRC Chairman Gregory Jaczko cast a dissenting vote citing safety concerns stemming from Japan's 2011 Fukushima nuclear disaster, and saying "I cannot support issuing this license as if Fukushima never happened". Jaczko resigned in April 2012. One week after Southern received the license to begin major construction on the two new reactors, a dozen environmental and anti-nuclear groups sued to stop the Plant Vogtle expansion project, saying "public safety and environmental problems since Japan's Fukushima Daiichi nuclear reactor accident have not been taken into account". In July 2012, the suit was rejected by the Washington, D.C. Circuit Court of Appeals. Countries such as Australia, Austria, Denmark, Greece, Ireland, Italy, Latvia, Liechtenstein, Luxembourg, Malta, Portugal, Israel, Malaysia, New Zealand, and Norway have no nuclear power reactors and remain opposed to nuclear power. However, by contrast, some countries remain in favor, and financially support nuclear fusion research, including EU wide funding of the ITER project. Percentage of a nations electricity, produced by fission-electric power stations. Net electrical generation by source and growth from 1980 to 2010. (Brown) - fossil fuels. (Red) - Fission. (Green)- "all renewables". In terms of energy generated between 1980 and 2010, the contribution from fission grew the fastest. Nuclear power capacity remained relatively stable between the mid 1980s until the accident at the Fukushima Daiichi reactor in March 2011. In June 2015, Platts reported global nuclear generation increased by 1% in 2014, the first annual increase since Fukushima. Many military and some civilian (such as some icebreaker) ships use nuclear marine propulsion, a form of nuclear propulsion. A few space vehicles have been launched using full-fledged nuclear reactors: 33 reactors belong to the Soviet RORSAT series and one was the American SNAP-10A. Regional differences in the use of fission energy are large. Fission energy generation, with a 20% share of the U.S. electricity production, is the single largest deployed technology among current low-carbon power sources in the country. In addition, two-thirds of the European Union's twenty-seven nations' low-carbon energy is produced by fission. Some of these nations have banned its generation, such as Italy, which ended the use of fission-electric generation, which started in 1963, in 1990. France is the largest user of nuclear energy, deriving 75% of its electricity from fission. In 2013, the IAEA reported that there were 437 operational civil fission-electric reactors in 31 countries, although not every reactor was producing electricity. In addition, there were approximately 140 naval vessels using nuclear propulsion in operation, powered by some 180 reactors. As of 2013, attaining a net energy gain from sustained nuclear fusion reactions, excluding natural fusion power sources such as the Sun, remains an ongoing area of international physics and engineering research. With commercial fusion power production remaining unlikely before 2050. Since commercial nuclear energy began in the mid-1950s, 2008 was the first year that no new nuclear power plant was connected to the grid, although two were connected in 2009. In 2015, the IAEA reported that worldwide there were 67 civil fission-electric power reactors under construction in 15 countries including Gulf states such as the United Arab Emirates (UAE). Over half of the 67 total being built were in Asia, with 28 in China. Eight new grid connections were completed by China in 2015 and the most recently completed reactor to be connected to the electrical grid, as of January 2016, was at the Kori Nuclear Power Plant in the Republic of Korea. In the US, four new Generation III reactors were under construction at Vogtle and Summer station, while a fifth was nearing completion at Watts Bar station, all five were expected to become operational before 2020. In 2013, four aging uncompetitive U.S reactors were closed. According to the World Nuclear Association, the global trend is for new nuclear power stations coming online to be balanced by the number of old plants being retired. George W. Bush signing the Energy Policy Act of 2005, which was designed to promote the US nuclear power industry, through incentives and subsidies, including cost-overrun support up to a total of $2 billion for six new nuclear plants. However, as of 2014 some electric utilities have rebuffed the loan package, including South Carolina Electric and Gas which operates Summer Station(the location of 2 new builds), noting instead that "it was easier to raise [loan] money commercially." Nuclear power plants typically have high capital costs for building the plant, but low fuel costs. Although nuclear power plants can vary their output the electricity is generally less favorably priced when doing so. Nuclear power plants are therefore typically run as much as possible to keep the cost of the generated electrical energy as low as possible, supplying mostly base-load electricity. Internationally the price of nuclear plants rose 15% annually in 1970-1990. [page needed] Yet, nuclear power has total costs in 2012 of about $96 per megawatt hour (MWh), most of which involves capital construction costs, compared with solar power at $130 per MWh, and natural gas at the low end at $64 per MWh. In 2015, the Bulletin of the Atomic Scientists unveiled the Nuclear Fuel Cycle Cost Calculator, an online tool that estimates the full cost of electricity produced by three configurations of the nuclear fuel cycle. Two years in the making, this interactive calculator is the first generally accessible model to provide a nuanced look at the economic costs of nuclear power; it lets users test how sensitive the price of electricity is to a full range of components—more than 60 parameters that can be adjusted for the three configurations of the nuclear fuel cycle considered by this tool (once-through, limited-recycle, full-recycle). Users can select the fuel cycle they would like to examine, change cost estimates for each component of that cycle, and even choose uncertainty ranges for the cost of particular components. This approach allows users around the world to compare the cost of different nuclear power approaches in a sophisticated way, while taking account of prices relevant to their own countries or regions. In recent years there has been a slowdown of electricity demand growth. In Eastern Europe, a number of long-established projects are struggling to find finance, notably Belene in Bulgaria and the additional reactors at Cernavoda in Romania, and some potential backers have pulled out. Where the electricity market is competitive, cheap natural gas is available, and its future supply relatively secure, this also poses a major problem for nuclear projects and existing plants. Following the 2011 Fukushima Daiichi nuclear disaster, costs are expected to increase for currently operating and new nuclear power plants, due to increased requirements for on-site spent fuel management and elevated design basis threats. The economics of new nuclear power plants is a controversial subject, since there are diverging views on this topic, and multibillion-dollar investments ride on the choice of an energy source. Comparison with other power generation methods is strongly dependent on assumptions about construction timescales and capital financing for nuclear plants as well as the future costs of fossil fuels and renewables as well as for energy storage solutions for intermittent power sources. Cost estimates also need to take into account plant decommissioning and nuclear waste storage costs. On the other hand, measures to mitigate global warming, such as a carbon tax or carbon emissions trading, may favor the economics of nuclear power. There are multiple organizations which have taken a position on nuclear power and the nuclear power industry– some are proponents, and some are opponents. The majority of pro-nuclear energy organizations and associations is either industry-supported or directly formed from industry members as advocacy groups or trade associations. Friends of the Earth International, a network of environmental organizations. The nuclear power industry in western nations has a history of construction delays, cost overruns, plant cancellations, and nuclear safety issues despite significant government subsidies and support. In December 2013, Forbes magazine reported that, in developed countries, "reactors are not a viable source of new power". Even in developed nations where they make economic sense, they are not feasible because nuclear’s "enormous costs, political and popular opposition, and regulatory uncertainty". This view echoes the statement of former Exelon CEO John Rowe, who said in 2012 that new nuclear plants "don’t make any sense right now" and won’t be economically viable in the foreseeable future. John Quiggin, economics professor, also says the main problem with the nuclear option is that it is not economically-viable. Quiggin says that we need more efficient energy use and more renewable energy commercialization. Former NRC member Peter Bradford and Professor Ian Lowe have recently made similar statements. However, some "nuclear cheerleaders" and lobbyists in the West continue to champion reactors, often with proposed new but largely untested designs, as a source of new power. Much more new build activity is occurring in developing countries like South Korea, India and China. In March 2016, China had 30 reactors in operation, 24 under construction and plans to build more, However, according to a government research unit, China must not build "too many nuclear power reactors too quickly", in order to avoid a shortfall of fuel, equipment and qualified plant workers. In the US, licenses of almost half its reactors have been extended to 60 years, Two new Generation III reactors are under construction at Vogtle, a dual construction project which marks the end of a 34-year period of stagnation in the US construction of civil nuclear power reactors. The station operator licenses of almost half the present 104 power reactors in the US, as of 2008, have been given extensions to 60 years. As of 2012, U.S. nuclear industry officials expect five new reactors to enter service by 2020, all at existing plants. In 2013, four aging, uncompetitive, reactors were permanently closed. Relevant state legislatures are trying to close Vermont Yankee and Indian Point Nuclear Power Plant. 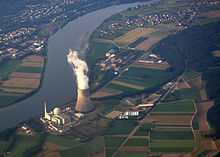 The U.S. NRC and the U.S. Department of Energy have initiated research into Light water reactor sustainability which is hoped will lead to allowing extensions of reactor licenses beyond 60 years, provided that safety can be maintained, as the loss in non-CO2-emitting generation capacity by retiring reactors "may serve to challenge U.S. energy security, potentially resulting in increased greenhouse gas emissions, and contributing to an imbalance between electric supply and demand." There is a possible impediment to production of nuclear power plants as only a few companies worldwide have the capacity to forge single-piece reactor pressure vessels, which are necessary in the most common reactor designs. Utilities across the world are submitting orders years in advance of any actual need for these vessels. Other manufacturers are examining various options, including making the component themselves, or finding ways to make a similar item using alternate methods. According to the World Nuclear Association, globally during the 1980s one new nuclear reactor started up every 17 days on average, and in the year 2015 it was estimated that this rate could in theory eventually increase to one every 5 days, although no plans exist for that. As of 2007, Watts Bar 1 in Tennessee, which came on-line on February 7, 1996, was the last U.S. commercial nuclear reactor to go on-line. This is often quoted as evidence of a successful worldwide campaign for nuclear power phase-out. Electricity shortages, fossil fuel price increases, global warming, and heavy metal emissions from fossil fuel use, new technology such as passively safe plants, and national energy security may renew the demand for nuclear power plants. 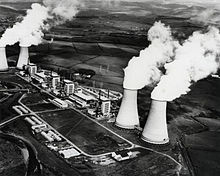 Unlike fossil fuel power plants, the only substance leaving the cooling towers of nuclear power plants is water vapour and thus does not pollute the air or cause global warming. Proportions of the isotopes, uranium-238 (blue) and uranium-235 (red) found naturally, versus grades that are enriched. light water reactors require fuel enriched to (3-4%), while others such as the CANDU reactor uses natural uranium. Uranium is a fairly common element in the Earth's crust. Uranium is approximately as common as tin or germanium in the Earth's crust, and is about 40 times more common than silver. Uranium is a constituent of most rocks, dirt, and of the oceans. The fact that uranium is so spread out is a problem because mining uranium is only economically feasible where there is a large concentration. Still, the world's present measured resources of uranium, economically recoverable at a price of 130 USD/kg, are enough to last for between 70 and 100 years. Even if the nuclear industry expands significantly, sufficient fuel is available for centuries. If advanced breeder reactors could be designed in the future to efficiently utilize recycled or depleted uranium and all actinides, then the resource utilization efficiency would be further improved by an additional factor of eight. For example, the OECD have determined that with a pure fast reactor fuel cycle with a burn up of, and recycling of, all the Uranium and actinides, actinides which presently make up the most hazardous substances in nuclear waste, there is 160,000 years worth of Uranium in total conventional resources and phosphate ore. According to the OECD's red book in 2011, due to increased exploration, known uranium resources have grown by 12.5% since 2008, with this increase translating into greater than a century of uranium available if the metals usage rate were to continue at the 2011 level. Current light water reactors make relatively inefficient use of nuclear fuel, fissioning only the very rare uranium-235 isotope. Nuclear reprocessing can make this waste reusable, and more efficient reactor designs, such as the currently under construction Generation III reactors achieve a higher efficiency burn up of the available resources, than the current vintage generation II reactors, which make up the vast majority of reactors worldwide. Breeder technology has been used in several reactors, but the high cost of reprocessing fuel safely, at 2006 technological levels, requires uranium prices of more than 200 USD/kg before becoming justified economically. Breeder reactors are still however being pursued as they have the potential to burn up all of the actinides in the present inventory of nuclear waste while also producing power and creating additional quantities of fuel for more reactors via the breeding process. In 2005, there were two breeder reactors producing power: the Phénix in France, which has since powered down in 2009 after 36 years of operation, and the BN-600 reactor, a reactor constructed in 1980 Beloyarsk, Russia which is still operational as of 2013. The electricity output of BN-600 is 600 MW — Russia plans to expand the nation's use of breeder reactors with the BN-800 reactor, was scheduled to become operational in 2014, but due to delays is not scheduled to produce power until 2017. The technical design of a yet larger breeder, the BN-1200 reactor was originally scheduled to be finalized in 2013, with construction slated for 2015 but has also been delayed. Japan's Monju breeder reactor restarted (having been shut down in 1995) in 2010 for 3 months, but shut down again after equipment fell into the reactor during reactor checkups, it is planned to become re-operational in late 2013. Both China and India are building breeder reactors. With the Indian 500 MWe Prototype Fast Breeder Reactor scheduled to become operational in 2014, with plans to build five more by 2020. The China Experimental Fast Reactor began producing power in 2011. The nuclear industry also produces a large volume of low-level radioactive waste in the form of contaminated items like clothing, hand tools, water purifier resins, and (upon decommissioning) the materials of which the reactor itself is built. In the US, the Nuclear Regulatory Commission has repeatedly attempted to allow low-level materials to be handled as normal waste: landfilled, recycled into consumer items, etcetera. In countries with nuclear power, radioactive wastes comprise less than 1% of total industrial toxic wastes, much of which remains hazardous for long periods. Overall, nuclear power produces far less waste material by volume than fossil-fuel based power plants. Coal-burning plants are particularly noted for producing large amounts of toxic and mildly radioactive ash due to concentrating naturally occurring metals and mildly radioactive material from the coal. A 2008 report from Oak Ridge National Laboratory concluded that coal power actually results in more radioactivity being released into the environment than nuclear power operation, and that the population effective dose equivalent, or dose to the public from radiation from coal plants is 100 times as much as from the ideal operation of nuclear plants. Indeed, coal ash is much less radioactive than spent nuclear fuel on a weight per weight basis, but coal ash is produced in much higher quantities per unit of energy generated, and this is released directly into the environment as fly ash, whereas nuclear plants use shielding to protect the environment from radioactive materials, for example, in dry cask storage vessels. Disposal of nuclear waste is often said to be the Achilles' heel of the industry. Presently, waste is mainly stored at individual reactor sites and there are over 430 locations around the world where radioactive material continues to accumulate. Some experts suggest that centralized underground repositories which are well-managed, guarded, and monitored, would be a vast improvement. There is an "international consensus on the advisability of storing nuclear waste in deep geological repositories", with the lack of movement of nuclear waste in the 2 billion year old natural nuclear fission reactors in Oklo, Gabon being cited as "a source of essential information today." As of 2009 there were no commercial scale purpose built underground repositories in operation. The Waste Isolation Pilot Plant in New Mexico has been taking nuclear waste since 1999 from production reactors, but as the name suggests is a research and development facility. Reprocessing can potentially recover up to 95% of the remaining uranium and plutonium in spent nuclear fuel, putting it into new mixed oxide fuel. This produces a reduction in long term radioactivity within the remaining waste, since this is largely short-lived fission products, and reduces its volume by over 90%. Reprocessing of civilian fuel from power reactors is currently done in Britain, France and (formerly) Russia, soon will be done in China and perhaps India, and is being done on an expanding scale in Japan. The full potential of reprocessing has not been achieved because it requires breeder reactors, which are not commercially available. France is generally cited as the most successful reprocessor, but it presently only recycles 28% (by mass) of the yearly fuel use, 7% within France and another 21% in Russia. Some serious nuclear and radiation accidents have occurred. Benjamin K. Sovacool has reported that worldwide there have been 99 accidents at nuclear power plants. Fifty-seven accidents have occurred since the Chernobyl disaster, and 57% (56 out of 99) of all nuclear-related accidents have occurred in the USA. Nuclear power plant accidents include the Chernobyl accident (1986) with approximately 60 deaths so far attributed to the accident and a predicted, eventual total death toll, of from 4000 to 25,000 latent cancers deaths. The Fukushima Daiichi nuclear disaster (2011), has not caused any radiation related deaths, with a predicted, eventual total death toll, of from 0 to 1000, and the Three Mile Island accident (1979), no causal deaths, cancer or otherwise, have been found in follow up studies of this accident. Nuclear-powered submarine mishaps include the K-19 reactor accident (1961), the K-27 reactor accident (1968), and the K-431 reactor accident (1985). International research is continuing into safety improvements such as passively safe plants, and the possible future use of nuclear fusion. In terms of lives lost per unit of energy generated, nuclear power has caused fewer accidental deaths per unit of energy generated than all other major sources of energy generation. Energy produced by coal, petroleum, natural gas and hydropower has caused more deaths per unit of energy generated, from air pollution and energy accidents. This is found in the following comparisons, when the immediate nuclear related deaths from accidents are compared to the immediate deaths from these other energy sources, when the latent, or predicted, indirect cancer deaths from nuclear energy accidents are compared to the immediate deaths from the above energy sources, and when the combined immediate and indirect fatalities from nuclear power and all fossil fuels are compared, fatalities resulting from the mining of the necessary natural resources to power generation and to air pollution. With these data, the use of nuclear power has been calculated to have prevented in the region of 1.8 million deaths between 1971 and 2009, by reducing the proportion of energy that would otherwise have been generated by fossil fuels, and is projected to continue to do so. Although according to Benjamin K. Sovacool, fission energy accidents ranked first in terms of their total economic cost, accounting for 41 percent of all property damage attributed to energy accidents. Analysis presented in the international Journal, Human and Ecological Risk Assessment found that coal, oil, Liquid petroleum gas and hydroelectric accidents(primarily due to the Banqiao dam burst) have resulted in greater economic impacts than nuclear power accidents. Following the 2011 Japanese Fukushima nuclear disaster, authorities shut down the nation's 54 nuclear power plants, but it has been estimated that if Japan had never adopted nuclear power, accidents and pollution from coal or gas plants would have caused more lost years of life. As of 2013, the Fukushima site remains highly radioactive, with some 160,000 evacuees still living in temporary housing, and some land will be unfarmable for centuries. The difficult Fukushima disaster cleanup will take 40 or more years, and cost tens of billions of dollars. Forced evacuation from a nuclear accident may lead to social isolation, anxiety, depression, psychosomatic medical problems, reckless behavior, even suicide. Such was the outcome of the 1986 Chernobyl nuclear disaster in Ukraine. A comprehensive 2005 study concluded that "the mental health impact of Chernobyl is the largest public health problem unleashed by the accident to date". Frank N. von Hippel, a U.S. scientist, commented on the 2011 Fukushima nuclear disaster, saying that "fear of ionizing radiation could have long-term psychological effects on a large portion of the population in the contaminated areas". A fundamental goal for American and global security is to minimize the nuclear proliferation risks associated with the expansion of nuclear power. If this development is "poorly managed or efforts to contain risks are unsuccessful, the nuclear future will be dangerous". The Global Nuclear Energy Partnership is one such international effort to create a distribution network in which developing countries in need of energy, would receive nuclear fuel at a discounted rate, in exchange for that nation agreeing to forgo their own indigenous develop of a uranium enrichment program. The France-based Eurodif/European Gaseous Diffusion Uranium Enrichment Consortium was/is one such program that successfully implemented this concept, with Spain and other countries without enrichment facilities buying a share of the fuel produced at the French controlled enrichment facility, but without a transfer of technology. Iran was an early participant from 1974, and remains a shareholder of Eurodif via Sofidif. On the other hand, one factor influencing the support of power reactors is due to the appeal that these reactors have at reducing nuclear weapons arsenals through the Megatons to Megawatts Program, a program which eliminated 425 metric tons of highly enriched uranium(HEU), the equivalent of 17,000 nuclear warheads, by diluting it with natural uranium making it equivalent to low enriched uranium(LEU), and thus suitable as nuclear fuel for commercial fission reactors. This is the single most successful non-proliferation program to date. The Megatons to Megawatts Program, the brainchild of Thomas Neff of MIT, was hailed as a major success by anti-nuclear weapon advocates as it has largely been the driving force behind the sharp reduction in the quantity of nuclear weapons worldwide since the cold war ended. However without an increase in nuclear reactors and greater demand for fissile fuel, the cost of dismantling and down blending has dissuaded Russia from continuing their disarmament. Currently, according to Harvard professor Matthew Bunn: "The Russians are not remotely interested in extending the program beyond 2013. We've managed to set it up in a way that costs them more and profits them less than them just making new low-enriched uranium for reactors from scratch. But there are other ways to set it up that would be very profitable for them and would also serve some of their strategic interests in boosting their nuclear exports." Up to 2005, the Megatons to Megawatts Program had processed $8 billion of HEU/weapons grade uranium into LEU/reactor grade uranium, with that corresponding to the elimination of 10,000 nuclear weapons. For approximately two decades, this material generated nearly 10 percent of all the electricity consumed in the United States (about half of all US nuclear electricity generated) with a total of around 7 trillion kilowatt-hours of electricity produced. Enough energy to energize the entire United States electric grid for about two years. In total it is estimated to have cost $17 billion, a "bargain for US ratepayers", with Russia profiting $12 billion from the deal. Much needed profit for the Russian nuclear oversight industry, which after the collapse of the Soviet economy, had difficulties paying for the maintenance and security of the Russian Federations highly enriched uranium and warheads. In April 2012 there were thirty one countries that have civil nuclear power plants, of which nine have nuclear weapons, with the vast majority of these nuclear weapons states having first produced weapons, before commercial fission electricity stations. Moreover, the re-purposing of civilian nuclear industries for military purposes would be a breach of the Non-proliferation treaty, of which 190 countries adhere to. 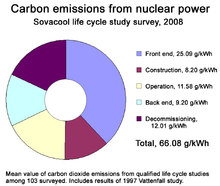 A 2008 synthesis of 103 studies, published by Benjamin K. Sovacool, estimated that the value of CO2 emissions for nuclear power over the lifecycle of a plant was 66.08 g/kW·h. Comparative results for various renewable power sources were 9–32 g/kW·h. A 2012 study by Yale University arrived at a different value, with the mean value, depending on which Reactor design was analyzed, ranging from 11 to 25 g/kW·h of total life cycle nuclear power CO2 emissions. According to the United Nations (UNSCEAR), regular nuclear power plant operation including the nuclear fuel cycle causes radioisotope releases into the environment amounting to 0.0002 millisieverts (mSv) per year of public exposure as a global average. (Such is small compared to variation in natural background radiation, which averages 2.4 mSv/a globally but frequently varies between 1 mSv/a and 13 mSv/a depending on a person's location as determined by UNSCEAR). 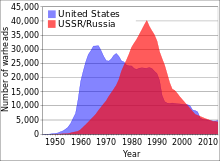 As of a 2008 report, the remaining legacy of the worst nuclear power plant accident (Chernobyl) is 0.002 mSv/a in global average exposure (a figure which was 0.04 mSv per person averaged over the entire populace of the Northern Hemisphere in the year of the accident in 1986, although far higher among the most affected local populations and recovery workers). Renewable electricity supply in the 20-50+% range has already been implemented in several European systems, albeit in the context of an integrated European grid system. In 2012, the share of electricity generated by renewable sources in Germany was 21.9%, compared to 16.0% for nuclear power after Germany shut down 7-8 of its 18 nuclear reactors in 2011. In the United Kingdom, the amount of energy produced from renewable energy is expected to exceed that from nuclear power by 2018, and Scotland plans to obtain all electricity from renewable energy by 2020. The majority of installed renewable energy across the world is in the form of hydro power. The cost of nuclear power has followed an increasing trend whereas the cost of electricity is declining for wind power. In about 2011, wind power became as inexpensive as natural gas, and anti-nuclear groups have suggested that in 2010 solar power became cheaper than nuclear power. Data from the EIA in 2011 estimated that in 2016, solar will have a levelized cost of electricity almost twice that of nuclear (21¢/kWh for solar, 11.39¢/kWh for nuclear), and wind somewhat less (9.7¢/kWh). However, the US EIA has also cautioned that levelized costs of intermittent sources such as wind and solar are not directly comparable to costs of "dispatchable" sources (those that can be adjusted to meet demand). The price of energy inputs and the environmental costs of every nuclear power plant continue long after the facility has finished generating its last useful electricity. Once no longer economically viable, nuclear reactors and uranium enrichment facilities are generally decommissioned, returning the facility and its parts to a safe enough level to be entrusted for other uses, such as greenfield status. After a cooling-off period that may last decades, reactor core materials are dismantled and cut into small pieces to be packed in containers for interim storage or transmutation experiments. The process is expensive, time-consuming, dangerous for workers and potentially hazardous to the natural environment as it presents opportunities for human error, accidents or sabotage. The total energy required for decommissioning can be[quantify] as much as 50% more than the energy needed for the original construction. [dubious – discuss] In most cases, the decommissioning process costs between US $300 million to US$5.6 billion. Decommissioning at nuclear sites which have experienced a serious accident are the most expensive and time-consuming. In the U.S. in 2011, there are 13 reactors that had permanently shut down and are in some phase of decommissioning. With Yankee Rowe Nuclear Power Station having completed the process in 2007, after ceasing commercial electricity production in 1992. The majority of the 15 years, was used to allow the station to naturally cool-down on its own, which makes the manual disassembly process both safer and cheaper. Proponents of nuclear energy contend that nuclear power is a sustainable energy source that reduces carbon emissions and increases energy security by decreasing dependence on imported energy sources. Proponents claim that nuclear power produces virtually no conventional air pollution, such as greenhouse gases and smog, in contrast to the chief viable alternative of fossil fuel. Nuclear power can produce base-load power unlike many renewables which are intermittent energy sources lacking large-scale and cheap ways of storing energy. M. King Hubbert saw oil as a resource that would run out, and proposed nuclear energy as a replacement energy source. Proponents claim that the risks of storing waste are small and can be further reduced by using the latest technology in newer reactors, and the operational safety record in the Western world is excellent when compared to the other major kinds of power plants. Opponents believe that nuclear power poses many threats to people and the environment. These threats include the problems of processing, transport and storage of radioactive nuclear waste, the risk of nuclear weapons proliferation and terrorism, as well as health risks and environmental damage from uranium mining. They also contend that reactors themselves are enormously complex machines where many things can and do go wrong; and there have been serious nuclear accidents. Critics do not believe that the risks of using nuclear fission as a power source can be fully offset through the development of new technology. They also argue that when all the energy-intensive stages of the nuclear fuel chain are considered, from uranium mining to nuclear decommissioning, nuclear power is neither a low-carbon nor an economical electricity source. Current fission reactors in operation around the world are second or third generation systems, with most of the first-generation systems having been retired some time ago. Research into advanced generation IV reactor types was officially started by the Generation IV International Forum (GIF) based on eight technology goals, including to improve nuclear safety, improve proliferation resistance, minimize waste, improve natural resource utilization, the ability to consume existing nuclear waste in the production of electricity, and decrease the cost to build and run such plants. Most of these reactors differ significantly from current operating light water reactors, and are generally not expected to be available for commercial construction before 2030. The nuclear reactors to be built at Vogtle are new AP1000 third generation reactors, which are said to have safety improvements over older power reactors. However, John Ma, a senior structural engineer at the NRC, is concerned that some parts of the AP1000 steel skin are so brittle that the "impact energy" from a plane strike or storm driven projectile could shatter the wall. Edwin Lyman, a senior staff scientist at the Union of Concerned Scientists, is concerned about the strength of the steel containment vessel and the concrete shield building around the AP1000. The Union of Concerned Scientists has referred to the EPR (nuclear reactor), currently under construction in China, Finland and France, as the only new reactor design under consideration in the United States that "...appears to have the potential to be significantly safer and more secure against attack than today's reactors." Construction of the ITER facility began in 2007, but the project has run into many delays and budget overruns. The facility is now not expected to begin operations until the year 2027 – 11 years after initially anticipated. A follow on commercial nuclear fusion power station, DEMO, has been proposed. There are also suggestions for a power plant based upon a different fusion approach, that of an inertial fusion power plant. ^ "Nuclear Energy". Energy Education is an interactive curriculum supplement for secondary-school science students, funded by the U. S. Department of Energy and the Texas State Energy Conservation Office (SECO). U. S. Department of Energy and the Texas State Energy Conservation Office (SECO). July 2010. Retrieved 2010-07-10. ^ a b "Key World Energy Statistics 2012" (PDF). International Energy Agency. 2012. Retrieved 2012-12-16. ^ "Nuclear Power Plants Information. Number of Reactors Operation Worldwide". International Atomic Energy Agency. Retrieved 2008-06-21. ^ a b "World Nuclear Power Reactors 2007-08 and Uranium Requirements". World Nuclear Association. 2008-06-09. Archived from the original on 2008-03-03. Retrieved 2008-06-21. ^ "BP Statistical Review of World Energy June 2012" (PDF). BP. Retrieved 2012-12-16. ^ "Collectively, life cycle assessment literature shows that nuclear power is similar to other renewable and much lower than fossil fuel in total life cycle GHG emissions.''". Nrel.gov. 2013-01-24. Retrieved 2013-06-22. ^ a b "IPCC Working Group III – Mitigation of Climate Change, Annex II I: Technology - specific cost and performance parameters" (PDF). IPCC. 2014. p. 10. Retrieved 2014-08-01. ^ a b "IPCC Working Group III – Mitigation of Climate Change, Annex II Metrics and Methodology. pg 37 to 40,41" (PDF). ^ "Prevented Mortality and Greenhouse Gas Emissions from Historical and Projected Nuclear Power - global nuclear power has prevented an average of 1.84 million air pollution-related deaths and 64 gigatonnes of CO2-equivalent (GtCO2-eq) greenhouse gas (GHG) emissions that would have resulted from fossil fuel burning". Pubs.acs.org. Bibcode:2013EnST...47.4889K. doi:10.1021/es3051197. ^ Union-Tribune Editorial Board (2011-03-27). "The nuclear controversy". Union-Tribune (San Diego). ^ a b Share. "Nuclear Waste Pools in North Carolina". Projectcensored.org. Retrieved 2010-08-24. ^ a b "Nuclear Power". Nc Warn. Retrieved 2013-06-22. ^ a b Sturgis, Sue. "Investigation: Revelations about Three Mile Island disaster raise doubts over nuclear plant safety". Southernstudies.org. Retrieved 2010-08-24. ^ a b c d e iPad iPhone Android TIME TV Populist The Page (2009-03-25). "The Worst Nuclear Disasters". Time.com. Retrieved 2013-06-22. ^ a b c d Johnston, Robert (2007-09-23). "Deadliest radiation accidents and other events causing radiation casualties". Database of Radiological Incidents and Related Events. ^ a b c "Dr. MacKay Sustainable Energy without the hot air". Data from studies by the Paul Scherrer Institute including non EU data. p. 168. Retrieved 2012-09-15. ^ a b Brendan Nicholson (2006-06-05). "Nuclear power 'cheaper, safer' than coal and gas". Melbourne: The Age. Retrieved 2008-01-18. ^ a b c Burgherr, P.; Hirschberg, S. (2008). "A Comparative Analysis of Accident Risks in Fossil, Hydro, and Nuclear Energy Chains" (PDF). Human and Ecological Risk Assessment: an International Journal 14 (5): 947. doi:10.1080/10807030802387556. Page 962 to 965. Comparing Nuclear's latent cancer deaths, such as cancer with other energy sources immediate deaths per unit of energy generated(GWeyr). This study does not include Fossil fuel related cancer and other indirect deaths created by the use of fossil fuel consumption in its "severe accident", an accident with more than 5 fatalities, classification. ^ "Moonshine". Atomicarchive.com. Retrieved 2013-06-22. ^ "The Atomic Solar System". Atomicarchive.com. Retrieved 2013-06-22. ^ taneya says:. "What do you mean by Induced Radioactivity?". Thebigger.com. Retrieved 2013-06-22. ^ "Otto Hahn, Fritz Strassmann, and Lise Meitner". Chemical Heritage Foundation. Retrieved 2007-11-01. ^ "Otto Robert Frisch". Nuclearfiles.org. Retrieved 2007-11-01. ^ Bain, Alastair S.; et al. (1997). Canada enters the nuclear age: a technical history of Atomic Energy of Canada. Magill-Queen's University Press. p. ix. ISBN 0-7735-1601-8. ^ "Nuclear Power in Russia". World Nuclear Association. Retrieved 2006-06-27. ^ "This Day in Quotes: SEPTEMBER 16 - Too cheap to meter: the great nuclear quote debate". This day in quotes. 2009. Retrieved 2009-09-16. ^ a b Rüdig, Wolfgang, ed. (1990). Anti-nuclear Movements: A World Survey of Opposition to Nuclear Energy. Detroit, MI: Longman Current Affairs. p. 1. ISBN 0-8103-9000-0. ^ a b Herbert P. Kitschelt (1986). "Political Opportunity and Political Protest: Anti-Nuclear Movements in Four Democracies" (PDF). British Journal of Political Science 16 (1): 57. ^ a b c Herbert P. Kitschelt (1986). "Political Opportunity and Political Protest: Anti-Nuclear Movements in Four Democracies" (PDF). British Journal of Political Science 16 (1): 71. ^ "The Political Economy of Nuclear Energy in the United States" (PDF). Social Policy. The Brookings Institution. 2004. Retrieved 2006-11-09. ^ a b "Nuclear Follies". Forbes magazine. 1985-02-11. ^ "Italy puts one year moratorium on nuclear". 2011-03-13. ^ "Trend in Electricity Supplied". Retrieved 2015-10-29. ^ "The Nuclear Renaissance". World Nuclear Association. Retrieved 2014-01-24. ^ a b WNA (2013-06-20). "Nuclear power down in 2012". World Nuclear News. ^ a b Sylvia Westall and Fredrik Dahl (2011-06-24). "IAEA Head Sees Wide Support for Stricter Nuclear Plant Safety". Scientific American. Archived from the original on 2014-04-14. ^ a b "Gauging the pressure". The Economist. 2011-04-28. ^ a b European Environment Agency (2013-01-23). "Late lessons from early warnings: science, precaution, innovation: Full Report". p. 476. ^ "Turkey Prepares to Host First ATMEA 1 Nuclear Reactors". PowerMag (Electric Power). Retrieved 2015-05-24. ^ "Italy announces nuclear moratorium". World Nuclear News. 2011-03-24. Retrieved 2011-05-23. ^ Aubrey Belford (2011-03-17). "Indonesia to Continue Plans for Nuclear Power". New York Times. ^ "IAEA sees slow nuclear growth post Japan". UPI. 2011-09-23. ^ a b "Nuclear power: When the steam clears". The Economist. 2011-03-24. ^ John Broder (2011-10-10). "The Year of Peril and Promise in Energy Production". New York Times. ^ a b Hsu, Jeremy (2012-02-09). "First Next-Gen US Reactor Designed to Avoid Fukushima Repeat". Live Science (hosted on Yahoo!). Retrieved 2012-02-09. ^ a b c Ayesha Rascoe (2012-02-09). "U.S. approves first new nuclear plant in a generation". Reuters. ^ Kristi E. Swartz (2012-02-16). "Groups sue to stop Vogtle expansion project". The Atlanta Journal-Constitution. ^ Duroyan Fertl (2011-06-05). "Germany: Nuclear power to be phased out by 2022". Green Left. ^ "Science/Nature | France gets nuclear fusion plant". BBC News. 2005-06-28. Retrieved 2014-01-24. ^ "NCPST Homepage | DCU". Ncpst.ie. Retrieved 2014-01-24. ^ "Summary status for the US". Energy Information Administration. 2010-01-21. Retrieved 2010-02-18. ^ Eleanor Beardsley (2006-05-01). "France Presses Ahead with Nuclear Power". NPR. Retrieved 2006-11-08. ^ "Gross electricity generation, by fuel used in power-stations". Eurostat. 2006. Retrieved 2007-02-03. ^ a b David Baurac (2002). "Passively safe reactors rely on nature to keep them cool". Logos (Argonne National Laboratory) 20 (1). Retrieved 2012-07-25. ^ Nicola Armaroli, Vincenzo Balzani, Towards an electricity-powered world. In: Energy and Environmental Science 4, (2011), 3193-3222, p. 3200, doi:10.1039/c1ee01249e. ^ Issues in Science & Technology Online; "Promoting Low-Carbon Electricity Production"
^ The European Strategic Energy Technology Plan SET-Plan Towards a low-carbon future 2010. Nuclear power provides "2/3 of the EU's low carbon energy" pg 6. ^ a b "PRIS - Home". Iaea.org. Retrieved 2013-06-14. ^ "Japan approves two reactor restarts". Taipei Times. 2013-06-07. Retrieved 2013-06-14. ^ "What is Nuclear Power Plant - How Nuclear Power Plants work | What is Nuclear Power Reactor - Types of Nuclear Power Reactors". EngineersGarage. Retrieved 2013-06-14. ^ "Nuclear-Powered Ships | Nuclear Submarines". World-nuclear.org. Retrieved 2013-06-14. ^ Trevor Findlay (2010). The Future of Nuclear Energy to 2030 and its Implications for Safety, Security and Nonproliferation: Overview, The Centre for International Governance Innovation (CIGI), Waterloo, Ontario, Canada, pp. 10-11. ^ Mycle Schneider, Steve Thomas, Antony Froggatt, and Doug Koplow (August 2009). The World Nuclear Industry Status Report 2009 Commissioned by German Federal Ministry of Environment, Nature Conservation and Reactor Safety, p. 5. Archived July 7, 2014, at the Wayback Machine. ^ "World doubles new build reactor capacity in 2015". London, UK: World Nuclear News. 4 January 2016. Retrieved 7 March 2016. ^ "World’s First APR-1400 Connected to Grid". Washington DC, USA: NEI (Nuclear Energy Institute). 21 January 2016. Retrieved 7 March 2016. ^ a b Mark Cooper (2013-06-18). "Nuclear aging: Not so graceful". Bulletin of the Atomic Scientists. ^ a b c Matthew Wald (2013-06-14). "Nuclear Plants, Old and Uncompetitive, Are Closing Earlier Than Expected". New York Times. ^ a b John Quiggin (2013-11-08). "Reviving nuclear power debates is a distraction. We need to use less energy". The Guardian. ^ a b c Kidd, Steve (2011-01-21). "New reactors—more or less?". Nuclear Engineering International. ^ The Future of Nuclear Power. Massachusetts Institute of Technology. 2003. ISBN 0-615-12420-8. Retrieved 2006-11-10. ^ "About Friends of the Earth International". Friends of the Earth International. Retrieved 2009-06-25. ^ "United Nations, Department of Public Information, Non-Governmental Organizations". Un.org. 2006-02-23. Retrieved 2010-08-24. ^ "Bruce Power’s Unit 2 sends electricity to Ontario grid for first time in 17 years". Bruce Power. 2012-10-16. Retrieved 2014-01-24. ^ James Kanter (2009-05-28). "In Finland, Nuclear Renaissance Runs Into Trouble". New York Times. ^ a b Hannah Northey (2011-03-18). "Former NRC Member Says Renaissance is Dead, for Now". New York Times. ^ Ian Lowe (2011-03-20). "No nukes now, or ever". The Age (Melbourne). ^ Leo Hickman (2012-11-28). "Nuclear lobbyists wined and dined senior civil servants, documents show". The Guardian (London). ^ Diane Farseta (2008-09-01). "The Campaign to Sell Nuclear". Bulletin of the Atomic Scientists 64 (4): 38–56. ^ "Nuclear group spent $460,000 lobbying in 4Q". Business Week. 2010-03-19. ^ "Nuclear Power in China". London,UK: World Nuclear Association. March 2016. Retrieved 7 March 2016. ^ "China is Building the World's Largest Nuclear Capacity". 21cbh.com. 2010-09-21. ^ "NRC/DOE Life After 60 Workshop Report" (PDF). 2008. Archived from the original (PDF) on July 10, 2011. Retrieved 2009-04-01. ^ "Nuclear Energy's Role in Responding to the Energy Challenges of the 21st Century" (PDF). Idaho National Engineering and Environmental Laboratory. Retrieved 2008-06-21. ^ "Second Thoughts About Nuclear Power" (PDF). A Policy Brief - Challenges Facing Asia. January 2011. Archived from the original (PDF) on 2015-04-16. ^ "Uranium resources sufficient to meet projected nuclear energy requirements long into the future". Nuclear Energy Agency (NEA). 2008-06-03. Retrieved 2008-06-16. ^ Uranium 2007 – Resources, Production and Demand. Nuclear Energy Agency, Organisation for Economic Co-operation and Development. 2008-06-10. ISBN 978-92-64-04766-2. ^ "Uranium 2011 - OECD Online Bookshop". Oecdbookshop.org. Retrieved 2013-06-14. ^ "Global Uranium Supply Ensured For Long Term, New Report Shows". Oecd-nea.org. 2012-07-26. Retrieved 2013-06-14. ^ a b "Waste Management in the Nuclear Fuel Cycle". Information and Issue Briefs. World Nuclear Association. 2006. Retrieved 2006-11-09. ^ John McCarthy (2006). "Facts From Cohen and Others". Progress and its Sustainability. Stanford. Retrieved 2006-11-09. Citing Breeder reactors: A renewable energy source, American Journal of Physics, vol. 51, (1), Jan. 1983. ^ "Sodium coolant arrives at Beloyarsk". World-nuclear-news.org. 2013-01-24. Retrieved 2013-06-14. ^ "Large fast reactor approved for Beloyarsk". World-nuclear-news.org. 2012-06-27. Retrieved 2013-06-14. ^ "Atomic agency plans to restart Monju prototype fast breeder reactor - AJW by The Asahi Shimbun". Ajw.asahi.com. Retrieved 2013-06-14. ^ "India's breeder reactor to be commissioned in 2013". Hindustan Times. Retrieved 2013-06-14. ^ "China makes nuclear power development - Xinhua | English.news.cn". News.xinhuanet.com. Retrieved 2013-06-14. ^ "Thorium". Information and Issue Briefs. World Nuclear Association. 2006. Retrieved 2006-11-09. ^ Brown, Paul (2004-04-14). "Shoot it at the sun. Send it to Earth's core. 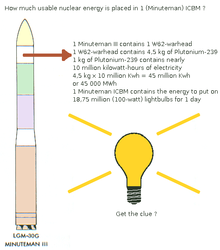 What to do with nuclear waste?". The Guardian (London). ^ National Research Council (1995). Technical Bases for Yucca Mountain Standards. Washington, D.C.: National Academy Press. p. 91. ISBN 0-309-05289-0. ^ "George Monbiot – A Waste of Waste". Monbiot.com. Retrieved 2013-06-14. ^ Sevior M. (2006). "Considerations for nuclear power in Australia" (PDF). International Journal of Environmental Studies 63 (6): 859–872. doi:10.1080/00207230601047255. ^ Alex Gabbard (2008-02-05). "Coal Combustion: Nuclear Resource or Danger". Oak Ridge National Laboratory. Retrieved 2008-01-31. 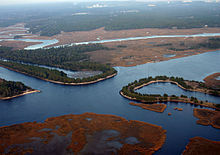 ^ "Coal ash is not more radioactive than nuclear waste". CE Journal (Center for Environmental Journalism). 2008-12-31. ^ "A Nuclear Power Renaissance?". Scientific American. 2008-04-28. Retrieved 2008-05-15. ^ "Nuclear Fuel Reprocessing: U.S. Policy Development" (PDF). Retrieved 2009-07-25. ^ "Adieu to nuclear recycling". Nature 460 (7252): 152. 2009. Bibcode:2009Natur.460R.152.. doi:10.1038/460152b. ^ Hambling, David (2003-07-30). "'Safe' alternative to depleted uranium revealed". New Scientist. Retrieved 2008-07-16. ^ Stevens, J. B.; R. C. Batra. "Adiabatic Shear Banding in Axisymmetric Impact and Penetration Problems". Virginia Polytechnic Institute and State University. Retrieved 2008-07-16. ^ Tomoko Yamazaki and Shunichi Ozasa (2011-06-27). "Fukushima Retiree Leads Anti-Nuclear Shareholders at Tepco Annual Meeting". Bloomberg. ^ a b Benjamin K. Sovacool (August 2010). "A Critical Evaluation of Nuclear Power and Renewable Electricity in Asia". Journal of Contemporary Asia 40 (3): 393–400. ^ Benjamin K. Sovacool (2009). The Accidental Century - Prominent Energy Accidents in the Last 100 Years Archived August 21, 2012, at the Wayback Machine. ^ http://www.forbes.com/sites/jamesconca/2012/06/10/energys-deathprint-a-price-always-paid/ with and without Chernobyl's total predicted, by the Linear no-threshold, cancer deaths included. ^ Kharecha, P. A.; Hansen, J. E. (2013). "Prevented Mortality and Greenhouse Gas Emissions from Historical and Projected Nuclear Power". Environmental Science & Technology 47 (9): 4889. doi:10.1021/es3051197. ^ Sovacool, B. K. (2008). "The costs of failure: A preliminary assessment of major energy accidents, 1907–2007". Energy Policy 36 (5): 1802–1820. doi:10.1016/j.enpol.2008.01.040. ^ Dennis Normile (2012-07-27). "Is Nuclear Power Good for You?". Science 337 (6093): 395. doi:10.1126/science.337.6093.395-b. ^ Richard Schiffman (2013-03-12). "Two years on, America hasn't learned lessons of Fukushima nuclear disaster". The Guardian (London). ^ Martin Fackler (2011-06-01). "Report Finds Japan Underestimated Tsunami Danger". New York Times. ^ Andrew C. Revkin (2012-03-10). "Nuclear Risk and Fear, from Hiroshima to Fukushima". New York Times. ^ Frank N. von Hippel (September–October 2011). "The radiological and psychological consequences of the Fukushima Daiichi accident". Bulletin of the Atomic Scientists 67 (5): 27–36. doi:10.1177/0096340211421588. ^ a b Steven E. Miller & Scott D. Sagan (Fall 2009). "Nuclear power without nuclear proliferation?". Dædalus 138 (4): 7. doi:10.1162/daed.2009.138.4.7. ^ "home". usec.com. 2013-05-24. Retrieved 2013-06-14. ^ a b Sovacool, Benjamin (2011). Contesting the Future of Nuclear Power: A Critical Global Assessment of Atomic Energy. Hackensack, NJ: World Scientific. p. 190. ISBN 978-981-4322-75-1. ^ a b c A Farewell to Arms, 2014. ^ "Future Unclear For 'Megatons To Megawatts' Program". All Things Considered (NPR). 2009-12-05. Retrieved 2013-06-22. ^ "Megatons to Megawatts Eliminates Equivalent of 10,000 Nuclear Warheads". Usec.com. 2005-09-21. Retrieved 2013-06-22. ^ Warner, E. S.; Heath, G. A. (2012). 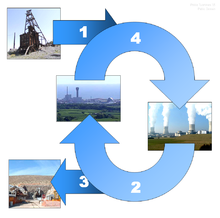 "Life Cycle Greenhouse Gas Emissions of Nuclear Electricity Generation". Journal of Industrial Ecology 16: S73. doi:10.1111/j.1530-9290.2012.00472.x. ^ "Energy Balances and CO2 Implications". World Nuclear Association. November 2005. Retrieved 2014-01-24. ^ "Life-cycle emissions analyses". Nei.org. Retrieved 2010-08-24. ^ a b c "UNSCEAR 2008 Report to the General Assembly" (PDF). United Nations Scientific Committee on the Effects of Atomic Radiation. 2008. ^ World Nuclear Association (September 2013). "Renewable Energy and Electricity". ^ Kloor, Keith (2013-01-11). "The Pro-Nukes Environmental Movement". Slate.com "The Big Questions" Blog (The Slate Group). Retrieved 2013-03-11. ^ Entwicklungen in der deutschen Strom- und Gaswirtschaft 2012 BDEW (german) Archived January 17, 2015, at the Wayback Machine. ^ Harvey, Fiona (2012-10-30). "Renewable energy will overtake nuclear power by 2018, research says". The Guardian (London). ^ Steve Colquhoun (2012-10-31). "Scotland aims for 100% renewable energy by 2020". The Sydney Morning Herald. Retrieved 2014-01-24. ^ a b Fiona Harvey (2011-05-09). "Renewable energy can power the world, says landmark IPCC study". The Guardian (London). ^  Archived October 21, 2012, at the Wayback Machine. ^ "Is solar power cheaper than nuclear power?". 2010-08-09. Retrieved 2013-01-04. ^ "Solar and Nuclear Costs — The Historic Crossover" (PDF). NC WARN. July 2010. Retrieved 2013-01-16. ^ "Levelized Cost of New Generation Resources in the Annual Energy Outlook 2011". U.S. Energy Information Administration. November 2010. Retrieved 2013-01-16. ^ Chris Namovicz (2013-06-17). "Assessing the Economic Value of New Utility-Scale Renewable Generation Projects" (PDF). US Energy Information Administration Energy Conference. ^ Nils Starfelt; Carl-Erik Wikdahl. "Economic Analysis of Various Options of Electricity Generation - Taking into Account Health and Environmental Effects" (PDF). Retrieved 2012-09-08. ^ "Closing and Decommissioning Nuclear Power Plants" (PDF). United Nations Environment Programme. 2012-03-07. ^ a b Sovacool, Benjamin (2011). Contesting the Future of Nuclear Power: A Critical Global Assessment of Atomic Energy. Hackensack, NJ: World Scientific. pp. 118–119. ISBN 978-981-4322-75-1. ^ M. King Hubbert (June 1956). "Nuclear Energy and the Fossil Fuels 'Drilling and Production Practice'" (PDF). API. p. 36. Retrieved 2008-04-18. ^ Mark Diesendorf. Is nuclear energy a possible solution to global warming? Archived July 22, 2012, at the Wayback Machine. ^ "4th Generation Nuclear Power — OSS Foundation". Ossfoundation.us. Retrieved 2014-01-24. ^ Matthew L. Wald (2010-04-22). "Critics Challenge Safety of New Reactor Design". New York Times. ^ "Nuclear Power in a Warming World" (PDF). Union of Concerned Scientists. Retrieved 2008-10-01. ^ a b Benjamin K. Sovacool (August 2010). "A Critical Evaluation of Nuclear Power and Renewable Electricity in Asia". Journal of Contemporary Asia 40 (3): 381. ^ Gerstner, E. (2009). "Nuclear energy: The hybrid returns" (PDF). Nature 460 (7251): 25–8. doi:10.1038/460025a. PMID 19571861. ^ T. Hamacher and A.M. Bradshaw (October 2001). "Fusion as a Future Power Source: Recent Achievements and Prospects" (PDF). World Energy Council. Archived from the original (PDF) on 2004-05-06. ^ "Overview of EFDA Activities". EFDA. European Fusion Development Agreement. Archived from the original on 2006-10-01. Retrieved 2006-11-11. This page was last modified on 26 April 2016, at 22:00.